A defensive genius, Géza Maróczy was the top player in his day. Winning tournament after tournament, Maróczy used this revolutionary style to shut down the leading attacking players of his day, even creating a new opening set-up: the “Maróczy bind”. At the peak of his playing career he, like players such as Bobby Fischer and Paul Morphy, made the startling decision to retire from chess. Unlike them though, Maróczy made a return,l tore through the competition and continued to win tournaments even later on in his life. 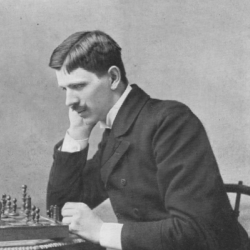 In 1895, Géza Maróczy won the “minor” tournament at Hastings. He followed this up with winning many first place prizes in international events over the next ten years. For a 6 year stretch, between 1902 and 1908, he played in 13 tournaments, winning 5 of them and finnishing in second place 5 other times. In 1906 he attempted to play against Emanuel Lasker for the World Championship, but due to problems in Cuba, the location of the match, the match had to be canceled. In 1908 Maróczy decided to retire from chess to focus more on his day job. After a number of years, he made a return to chess and helped Hungary to win the first two Chess Olympiads. He was awarded the title of Grandmaster after FIDE officially started using the title. Maróczy passed away on May 29, 1951.